"Dog diapers are a convenient way to help a dog with urinary problems or that is in heat. Choices include disposables and cloth or washable options. Eco-friendly options are also available which combine a washable with a disposable super absorbent pad. Diaper choice is based on your dog's size and owner preference." Canine diapers are available for dogs that are incontinent, females that are in heat, and puppies that are not yet housebroken. They are also useful for dogs that "dribble" when excited. If your dog only wears them when in heat, or if you have a puppy that is only going to be wearing them until housebroken, the cost may not be too great. But if you have a dog that is incontinent due to an injury, for example, and is going to need diapers long-term, it's a different matter. A package of ten disposable diapers costs about $12.95 for the small size and $17.95 for the large size. You can see how the cost could quickly add up. Canine diapers come in a variety of sizes, of course, to fit different breeds. When purchasing dog diapers, make sure you read the sizing chart carefully. It will tell you the weight and the measurement around the dog's waist that the diapers are made to fit. Measure your dog's waist to make sure you buy the right size. For male dogs, it is generally recommended that you buy one size larger. The sizes are different for different brands, so if you switch brands, make sure you read the sizing chart on the new brand. Most diapers for dogs are designed to hold urine, not feces. If you need a diaper that will hold feces as well as urine, make sure you read the product information for the diaper you are buying. You may want to use a combination of a disposable diaper underneath a washable diaper. Today, the latest technologies are available in both Disposable Diapers for Dogs and cloth dog diapers that use the latest fabrics or absorbent pads to absorb more. Many washables can last up to 300 washings. For dogs with a heavy urine flow, washable diapers can be combined with a disposable pad (shown below). Convenience: Cloth diapers are now available to be better fitted and without velcro closers. Cloth and disposable are now comparable in terms of what they do. Dryness: Today, a new type of washable diaper is on the market that is super absorbent and can be washed as many as 300 times. Cost: Disposables are more expensive than washable. Health: Many disposable canine diapers contain chemicals that help them to be absorbent. Cloth diapers are natural and if washed properly will not have chemicals on the surface. Environment: The answer to this question is not as clear since cloth needs to be washed and disposable fills landfills. Disposable Dog diapers as shown below come in all sizes and are easy and convenient to use. Dog Cloth Diapers are an eco-friendly solution. Washable dog diapers are lined with absorbent fabric. They are available as a classic diaper and as a dog washable wrap. 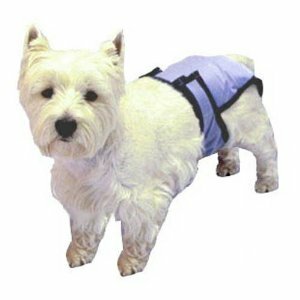 Dog protective pants are another option for the dog owners that is looking for a short term solution for dog urinary incontinence or for when a dog is in heat. They are easy to use, have velcro wings and are washable. What's better, cloth dog diapers or disposable? Help other owners by sharing your experiences.